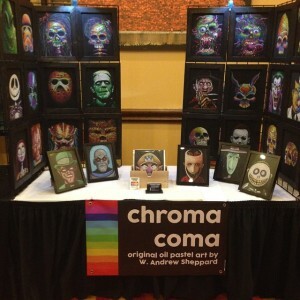 I met artist Andrew Sheppard at the Monster Mania Convention last weekend. Q: Where were you born? Where are you currently living? A: I was born in Charlotte, NC but I currently live in Columbia, SC. Q: When did you know you wanted to become an artist? A: I have always drawn since I was a little kid (like 4 years old). I continued through elementary school, junior high, and high school (where I first used oil pastels). I took a break in college and did a few craypas (another term for oil pastels) drawings for a band that a few of my good friends were in. After I graduated, I picked oil pastels back up because I missed them. And it was only a few months ago that I realized I wanted to give it a try professionally. Q: What was your first piece of art? A: My first piece of art that I remember doing and being really proud of was a prehistoric scenes with some dinosaurs when I was very young (maybe 6 or 7 years old). 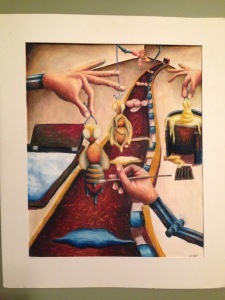 However, my first piece done in oil pastels was during freshman year of high school. It was of a picture of a guy on a motorcycle. It was zoomed in though so it was a close up of his arm and the front part of the motorcycle. I actually didn’t like it very much. A: I have been hugely influenced by impressionist artists such as Claude Monet and Vincent Van Gogh. Although, Tim Burton has always been a huge inspiration for me as well. I love all of his films, but “The Nightmare Before Christmas” has always been my favorite movie of all time. Illusory art such as that of M. C. Escher has always fascinated me. Finally, another local artist out of Columbia, SC, J. Spencer Shull and his wife Kelly have a company called Jellykoe where they make original art and plush. He helped inspire me and push me towards pursuing my art career. 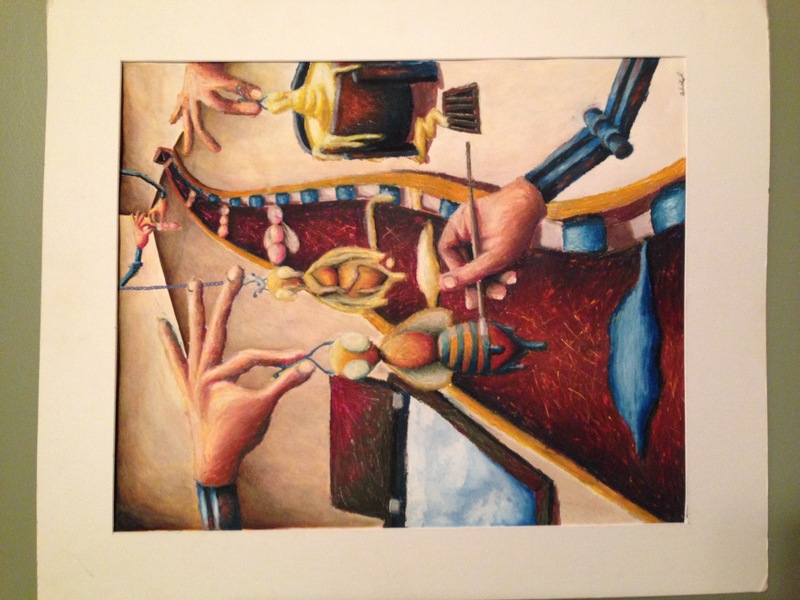 Q: Favorite piece of art you’ve created? Q: What is the hardest piece of art you’ve created? A: The hardest piece of art I’ve ever had to create was easily a wood sculpture I did junior year of high school. 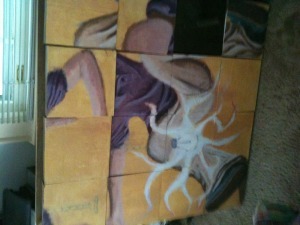 I decided I wanted to create a 15-puzzle (also called Gem Puzzle, Boss Puzzle, Game of Fifteen, or Mystic Square). 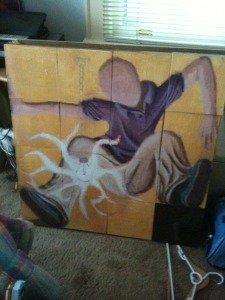 It is 2 feet 8 inches by 2 feet 8 inches and has a painted image of a faceless man trapped in the box. 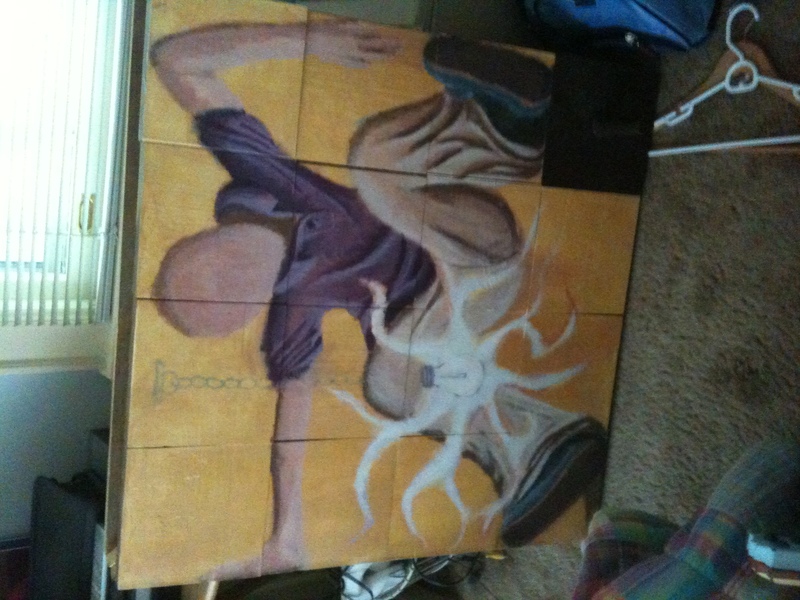 I would unfortunately still consider it unfinished even after working on it all of junior year, but it was an ambitious project and one that I know I could do better if I started over. Q: What was your experience like at Monster Mania? 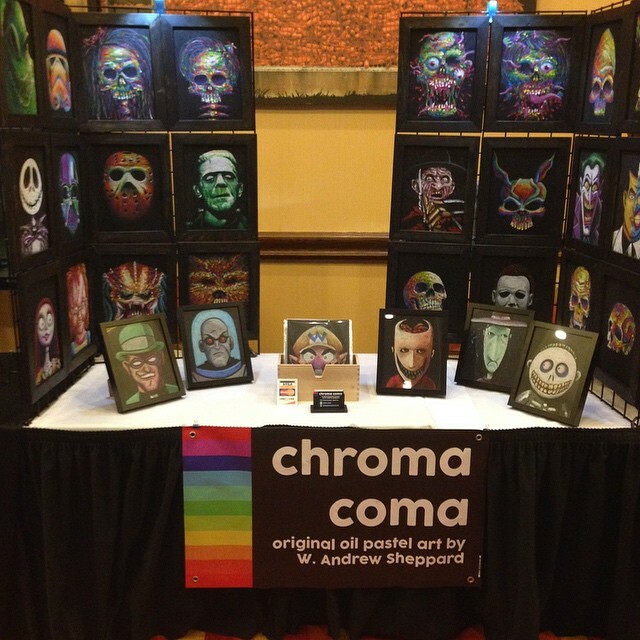 I heard that a famous person bought a few paintings..
A: My experience at Monster Mania was beyond what I could have ever imagined. I had a great reception and I was happy to hear from people that my art was something they had never seen before. 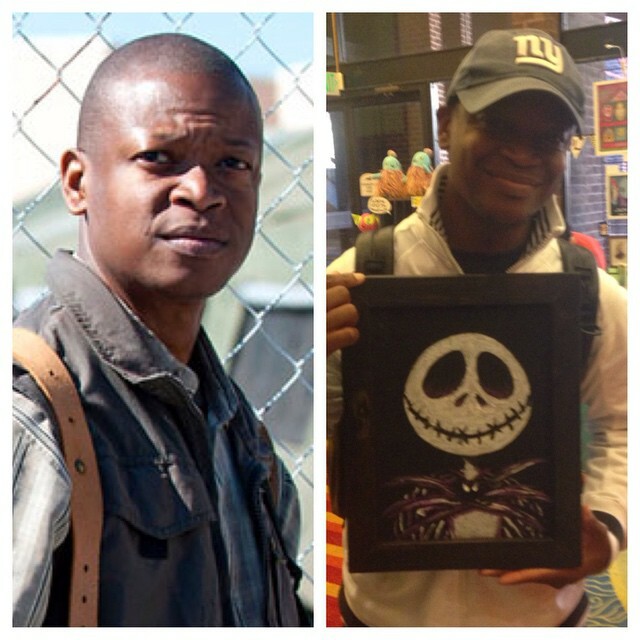 Also, as you mentioned, Lawrence Gilliard Jr. (Bob Stookey from “The Walking Dead”) bought two of my original drawings. I will most definitely be doing this show again next year.